KUSA – It couldn’t have been the play caller. We’ll find out soon enough if it was the quarterback. What the Broncos’ brain trust believes for certain is its problems in 2017 stemmed from its offensive system. The Broncos aren’t tweaking their offense this year – they 86’d it and devised a new one. “Yeah, it’s pretty much all different,’’ said Broncos offensive coordinator Bill Musgrave. The Broncos scored just 18.1 points per game in a 5-11 season last year. Only five teams scored fewer in the NFL. 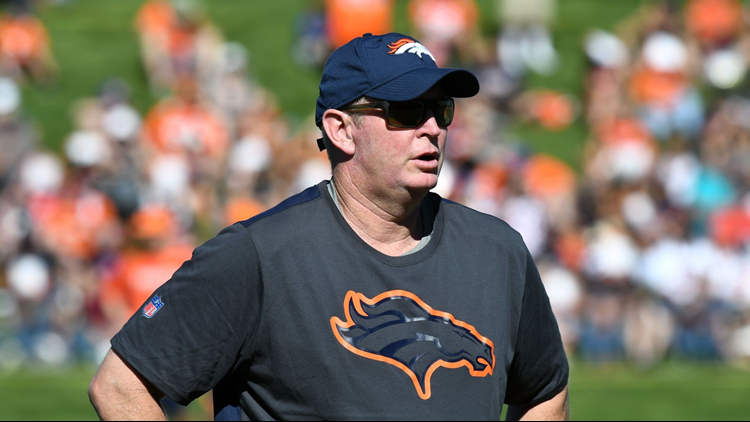 The reason why the play caller can’t be blamed is, statistically, the Broncos’ offense was a tad worse after offensive coordinator Mike McCoy was fired following game 10. Musgrave took over and while he made some subtle changes, it’s impossible to change an offensive system in midseason. Musgrave emphasized the run a little more than McCoy did, and he got his passes out of the quarterback’s hand quicker, which in turn led to protecting the ball better. But otherwise there wasn’t much he could do with a team that was already in the throes of a six-game losing streak, had little confidence and played four of its final six games on the road. This offseason, general manager John Elway, head coach Vance Joseph, personnel advisor Gary Kubiak, Musgrave, quarterbacks coach Mike Sullivan and other offensive assistants put their heads together. A new offense was born. The QBs, of course, were another adjustment. The top two from last season, Trevor Siemian and Brock Osweiler, are out. Case Keenum is in. McCoy has been a successful NFL coach, which is why he quickly got another offensive coordinator job with Arizona. But his system – which has many of the same principles the New England Patriots employ and worked well for the Broncos when Peyton Manning was their quarterback in 2012 – wasn’t a good fit for the collection of offensive talent in 2017. From the upstairs’ offices to the downstairs’ locker room, the Broncos to a man said the McCoy offense was too complicated, specifically in the verbiage. Translation: They know what to do when the play is called. The offensive struggles weren’t a one-year anomaly. The Broncos’ offense has been struggling since the second half of the 2014 season. They won a Super Bowl in 2015 with an offense that ranked 16th in yards, 19th in points. Adam Gase and Kubiak were the controlling offensive minds in those two seasons. So, it’s not just the system. In Keenum, the Broncos hope they will get their most consistent quarterback play since Manning’s last hurrah. There are plays in every game when the system is virtually worthless. But if you’re quarterback is capable, they can become some of your better plays.